Bestselling master of suspense Jeffery Deaver is back with a brand-new Lincoln Rhyme thriller. When Lincoln's estranged cousin Arthur Rhyme is arrested on murder charges, the case is perfect -- too perfect. Forensic evidence from Arthur's home is found all over the scene of the crime, and it looks like the fate of Lincoln's relative is sealed. At the behest of Arthur's wife, Judy, Lincoln grudgingly agrees to investigate the case. Soon Lincoln and Amelia uncover a string of similar murders and rapes with perpetrators claiming innocence and ignorance -- despite ironclad evidence at the scenes of the crime. Rhyme's team realizes this 'perfect' evidence may actually be the result of masterful identity theft and manipulation. When '522' learns the identities of the crime-fighting team, the hunters become the hunted. 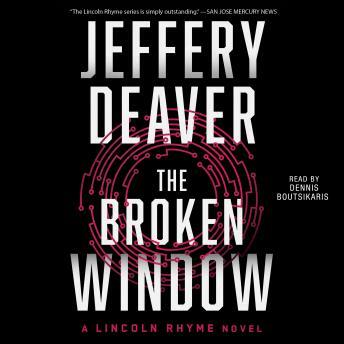 Full of Deaver's trademark plot twists, The Broken Window will put the partnership of Lincoln Rhyme and Amelia Sachs to the ultimate test. My first Jeffrey Deaver (Lincoln Rhyme) novel. I'm hooked! This is a thriller from start to finish. It keep me guessing until the end and then, wow!!! This was a pretty good book - in fact I sat in my car, in my driveway, to hear the ending. The only "downside" to it is that there are a couple of places where it just gets tedious to listen to, such as when long lists are being read. Talk about Big Brother watching you!!!! If only half of the "Data Mining" stuff is for real, then it is even more frightening. A great read. One of my favorites. One of the best stories I have listened to, this is my first for this Author & will listen to more.